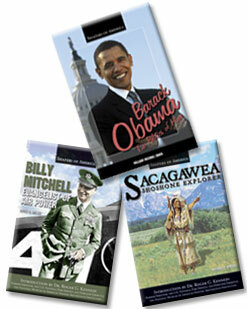 The new series Shapers of America includes biographies of interesting people whose important stories are not well known. The fully sourced texts draw on primary documents, such as letters, journal entries, and memoirs, while the attractive layout includes an easy-to-read typeface and more than 35 color photographs, illustrations, and maps. Dr. Roger G. Kennedy, the former director of the National Park Service and director emeritus of the National Museum of American History in Washington, D.C., has provided an introduction to the series. Call 1-866-356-OTTN (6886) or email sales@ottnpublishing.com for more information. You can also order any of these books from your favorite distributor, including the following: Follett Library Resources, Baker & Taylor, Brodart, Davidson Titles, Apple Books, Green Valley Book Company, Mackin Library Media, Garrett Book Company, SEBCO Books, and BWI. Click on a book above or choose a link below to find out more about each book. The description will open in a new window. For complete reviews of our books, please visit our Reviews page.